Senior officials of TAR UC welcoming the freshmen in the UC Main Hall during Mass Call. Datuk Dr Tan addressing the new students in his welcome speech. The freshmen reciting the student oath during Mass Call. 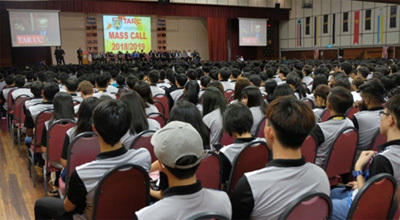 Excitement and anticipation filled the UC Main Hall on 21 May 2018 as thousands of freshmen attended Mass Call that welcomed them with open arms and signalled their new chapter in higher education at TAR UC. Despite their initial nervousness, the freshmen quickly warmed up after being entertained by the emcees through some jokes and a couple of songs to break the ice. After that the freshmen were given a glimpse of the campus lifestyle awaiting them through a series of videos showcasing the campus facilities and activities that were in store such as Society Day, Talentime Night, and Orientation Odyssey Night. Ong Yee Hong, President of the Student Representative Council ('SRC'), shared his own experience and journey from a TAR UC freshman to a student leader in his opening address. "Your journey in this campus will be a roller coaster ride. Always appreciate every single moment, because nothing can be compared with the memorable moments you will encounter during your time here," he advised. 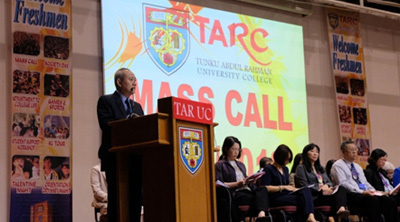 Datuk Dr Tan Chik Heok, President of TAR UC, was also present at the Mass Call to welcome the new students and share some advice in his welcome speech. "Entering the tertiary education is a very important stage in your life. Every step here will shape and carve your path towards success in your future career. 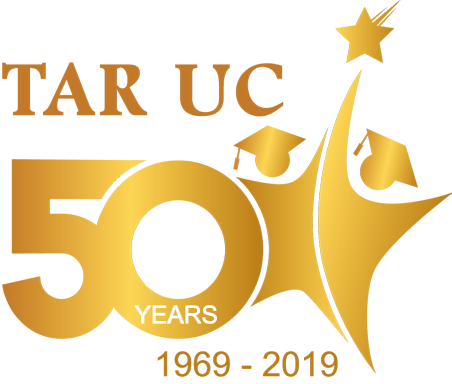 "We have strived to provide the most conducive campus experience possible and the variety of activities our clubs and societies have in store will also help in developing soft skills such as teambuilding, leadership, critical thinking and communication skills. "I urge you to take advantage of that, as these skills will help you rise up to the challenges of a highly competitive and globalised world," said Datuk Dr Tan. Alysha Lim, 18, who hails from Shah Alam and a Diploma in Business Studies (Marketing) student, is very much looking forward to a fruitful experience at TAR UC. "I am really excited because I have already made so many new friends here. I cannot wait to begin my educational journey at TAR UC. I am also hoping to join a club or society to further sharpen my soft skills." 19-year-old Marcus Lee who is pursuing his Diploma in Science (Computer Science and Statistics), said the extensive facilities at TAR UC helped him decide on furthering his studies here. "I am confident I can excel here especially with the top-notch facilities provided to students. I cannot wait for my practical classes to begin so I can start using the computer labs!" he exclaimed. For Choon Hian, a Diploma in Social Science (Counselling) student, TAR UC will become a stepping stone to his career in counselling. "The library is full of reference materials related to my field of study, and it will certainly help a lot in my goal of building a career in counselling," said Choon Hian, who also plans to join the chess club to develop his interpersonal skills. Bachelor of Banking and Finance (Hons) student Haaranraj from Kepong joined TAR UC on the back of recommendations from his peers and his confidence in the institution's professionally certified programmes. "TAR UC's reputation in its finance programmes helped in making my decision to enroll here easier. I hope I will be able to challenge myself academically here while making new friends that can expand my horizon," he added.